Advent at Swettenham is one of the most beautiful church services of the year in one of the loveliest old churches in Cheshire. 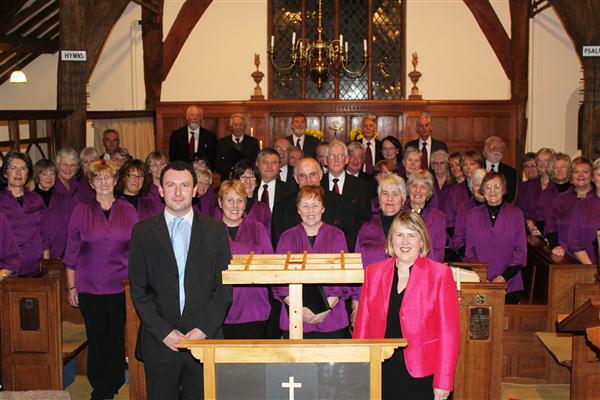 Congleton Choral Society has sung the service there for many years, due to its links with the late Sir Bernard Lovell, the society's patron. Sir Bernard lived alongside the church and was organist there for a long time. This year Christopher Cromar conducted in his first Advent service with the choir; he was told the result was 'spell‑binding'. Minister Reverend Ian Godfrey described how one of the pieces moved him to tears, which was a rare event for a person who hears so much of the beauty of English devotional music. MP Fiona Bruce loved the October concert and was looking forward to being at Swettenham. She is pictured here with conductor Christopher Cromar and the Choral society. The society's Christmas Carol Concert, is in the Town Hall on December 17th. Click here for more details.